ÆWhile we’re talking about companies like Apple getting alarmingly close to a $1 trillion market cap, both of Jack Dorsey’s companies — Twitter (at least before its earnings last week) and Square — have been on considerable runs, and it looks like the latter won’t be coming to a major halt after today’s quarterly report. The company reported its second-quarter results today, which were somewhat mixed compared to what Wall Street was expecting but didn’t appear to raise the kinds of significant red flags Twitter raised last week that sent its stock into a tailspin. The company outpaced what analysts expected for its earnings results as its core gross payment volume continued to rise and its net losses narrowed when compared to its second quarter last year. 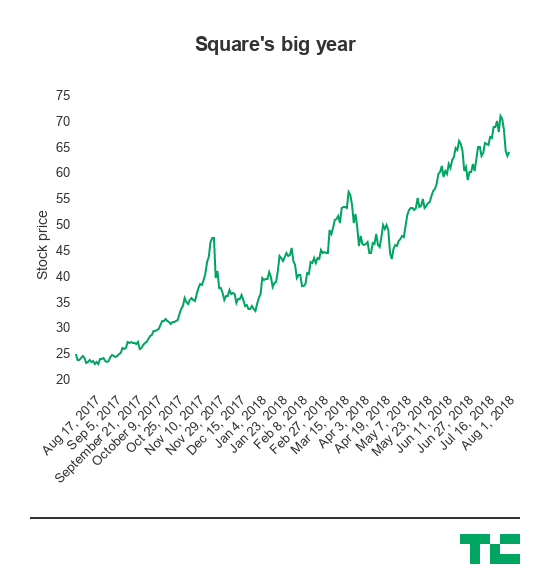 In a year that’s included some evolution in its hardware products and a bet on Bitcoin, Square has seen its stock more than double in the past 12 months and rise 90% since the beginning of the year. The stock is down around 2.5% this afternoon after the company posted its report, but for the most part, it isn’t the kind of substantial trip-up that would have been a major setback amid an otherwise high-velocity year. 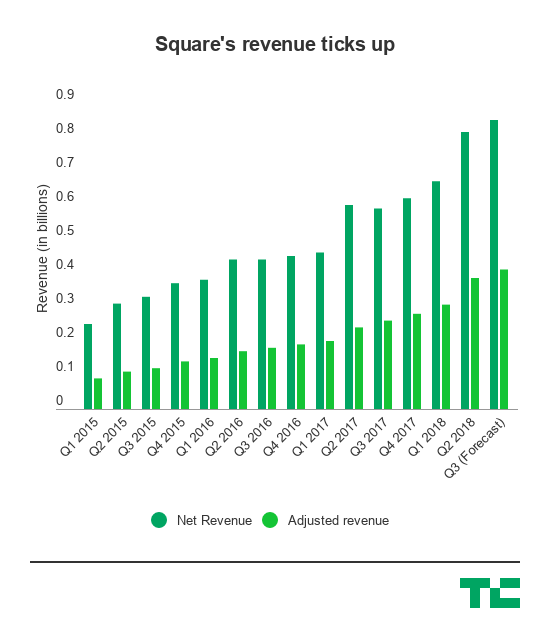 Square’s additional bets beyond its core business, including subscriptions and what it calls “services-based revenue” also more than doubled year-over-year on an adjusted basis, which was driven by its ancillary products like Caviar, Square Capital, it Cash Card, and its Instant Deposit service. The company said Square Capital facilitated more than 60,000 loans totaling $390 million, which is quickly becoming one of its big businesses to run alongside its typical payments system as it looks to snap up adoption of the entire operational stack for small businesses. The company also had two other lines of revenue that are showing some growth: its hardware business, which while small, is also growing quickly as a result of Square Register and its other hardware products; and Bitcoin, another play it’s making when it comes to its Cash products. Bitcoin generated $37 million in the second quarter, while its hardware division generated $18 million. All of these are part of a way for Square to diversify beyond just being a transaction tool for businesses and look to crack into all the other operational layers of how money generally moves across different surfaces, primarily focusing on the flow in and out of businesses.